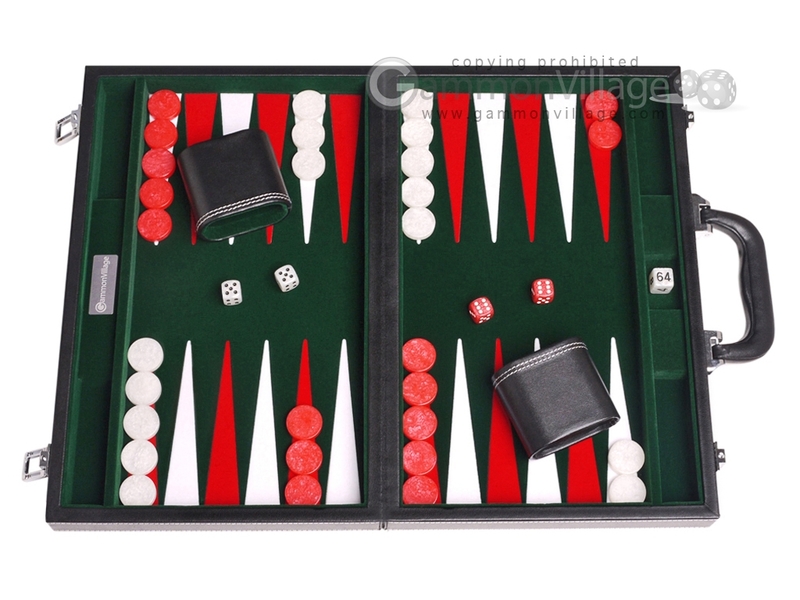 This classic 15-inch backgammon set offers incredible style and quality workmanship all in one package! Move your checkers around with ease and enjoyment on an ultra smooth inlaid velvet playing field. Additionally, the high-gloss checkers, in ghost white and red, come with a beautiful mother-of-pearl design. The dice cups are lined with the same velvet as the fern green playing field, and are similarly accented with double stitching. Closed Length: 15" Width: 9 3/4" Height: 2 3/8"
Open Length: 15" Width: 19 1/2" Height: 1 1/4"
Cup Height: 2 5/8" Width: 1 1/2" Length: 3"
Page P4619 Copyright © 1999-2019 GammonVillage Inc., USA. All rights reserved.